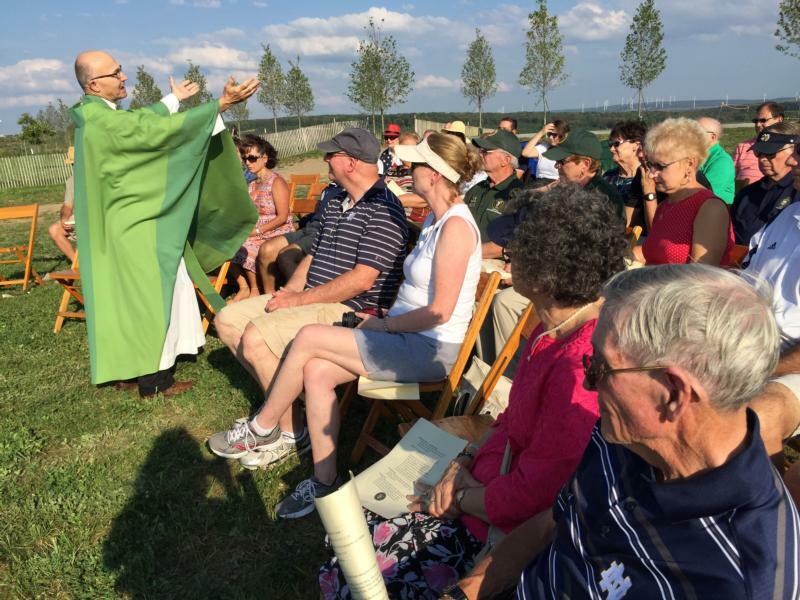 Fifteen years after United Flight 93 crashed in an open field in southern Pennsylvania, a small group of Catholics quietly gathered in the stillness of the site to remember the people who sacrificed their lives so that others might live. Msgr. Roger A. Statnick, pastor of St. Sebastian Parish in Belle Vernon, and a board member of the Notre Dame Club of Greensburg/Uniontown, celebrated an outdoor Mass of remembrance on a hill above the crash site for nearly 30 fellow club members at the Flight 93 National Memorial on Sept. 10, the eve of the anniversary. "Today we gather in this spot where 40 people gave their lives for the sake of others," Msgr. Statnick said. "Forty people who stand before us as the ongoing presence of the Lord Jesus for those of us who believe in Christ." Four commercial airliners were commandeered the morning of Sept. 11, 2001, by al-Qaida-linked terrorists in a calculated attack against the U.S. Two planes were flown into the World Trade Center's twin towers in New York City; a third flew into the Pentagon outside of Washington; and the fourth, Flight 93, went down in Somerset County. Msgr. Statnick drew from the story of the prodigal son in the day's Gospel reading during the Mass. He noted the older and younger son were alike "because they were both concerned about themselves" and also were motivated by fear. Likewise, "it is our fear that we may not be taken care of," Msgr. Statnick said. In the sacrament of confirmation, people of faith pray for the gifts of the Holy Spirit, he said. One of these gifts is courage, "the gift to act beyond our fears" and "act for others when we're tempted to simply take care of ourselves." "[This is] the gift that was given to our nation by these 40 people," Msgr. Statnick said. "Whether or not they were Christian, we see the spirit of God acting in their sacrifice. "And the gift was given to each of us here." "This place fills our hearts with sadness, but Christ's spirit fills us with hope," Msgr. Statnick said. As attendees softly sang, "Jesus, remember me when you come into your kingdom," Msgr. Statnick blessed a wreath in remembrance of the victims and placed it on the hillside overlooking the impact site -- marked by a large boulder -- and debris field. The fields and wooded area beyond are the final resting place of the passengers and crew. "They gave their lives for their family, friends, and nation," he said.